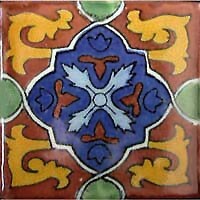 Mexican tile Grenada pattern includes terra cotta, cobalt, blue and orange colors. The Mexican painted tiles are no doubt vintage looking. You may consider them antique style when used in certain type of architecture. It is typical for Mexican talavera tile style found all over the country in old architecture, churches, fountain basins as well as modern buildings.